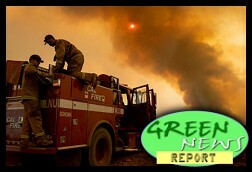 " 'Green News Report' - August 7, 2018	"
California Gov. Jerry Brown said the state has sufficient funds to pay for firefighting costs from the more than dozen large wildfires raging in the state. But the governor cautioned a downturn in the economy is inevitable at some point and could change the state's fiscal situation and require borrowing for such emergencies. California does not lack water to fight the Carr Fire and others burning across the state, officials said. 'Ridiculously warm' weather resulted in 13 feet of a mountaintop glacier melting in July. Nuclear power is one of the world's biggest sources of carbon-free electricity. But it has an Achilles' heel: it needs lots of water to operate...Worse still, scientists warn that thermal power interruptions will worsen because of climate change-not just because of heatwaves but also droughts. Florida's southwest coast, a ribbon of inlets and barrier islands normally brimming with wildlife, has become a red tide slaughterhouse this summer. A federal jury on Friday awarded more than $470 million to six neighbors of a hog farm in Pender County who complained of excessive noise, odor, flies, buzzards and other disruptions to their quality of life. Some of Smithfield's problems in North Carolina stem from its practice of collecting liquid excrement from hog operations in open-air pits, then spraying it on agricultural land. According to The Associated Press, that method of waste disposal was banned for new livestock operations in 1997, but Smithfield continues to do it because it's cheaper than other methods and helps keep pork production costs lower than in China. North Carolina Agriculture Commissioner Steve Troxler: "When they don't like it, they're biting the hand that feeds them. That's what I really don't understand. To put the word agriculture and nuisance in the same sentence is just ridiculous and quite frankly makes me madder than hell." When Cooper vetoed the bill he said "while agriculture is vital to North Carolina's economy," so are "property rights" that "are vital to people's homes and other businesses. "...Our laws must balance the needs of businesses versus property rights. Giving one industry special treatment at the expense of its neighbors is unfair." « PREVIOUS STORY "Trump Targets Media After Shooter Opens Fire at Progressive Radio Outlet: 'BradCast' 8/6/2018"
"'Green News Report' - August 7, 2018"
Great coverage Desi & Brad. Someone has to do it because the commercial media is failing to do so (Tools, Not Toys). Our beloved California is burning and our beloved east coast is shrinking due to global warming (Gassifer 2.0: The Least Coast).